NETWORK FINALS: SHARK TANK gained 0.1 in final numbers, while THE ORIGINALS lost the same. CABLE HIGHLIGHTS: We’s MAMA JUNE FROM NOT TO HOT repeated as Friday cable leader, down 0.08 to 0.48, with a pre-show half-hour at 0.37, and lead-out DR MIAMI was up 0.03 to 0.16. Discovery’s GOLD RUSH ticked up to 0.43, and lead-out PARKERS TRAIL was at 0.35. A&E’s LIVE PD was steady at 0.40. Nickelodeon’s noon PAW PATROL was the #4 show of the day, up 0.03 to 0.39, with lead-out BLAZE & THE MONSTER at 0.30, and the 5PM LOUD HOUSE was at 0.34. The family programming brigade was joined by Disney Channel’s 10AM MICKEY & THE ROADSTER at 0.32, and two lead-out episodes of PUPPY DOG PALS at 0.28/0.27. 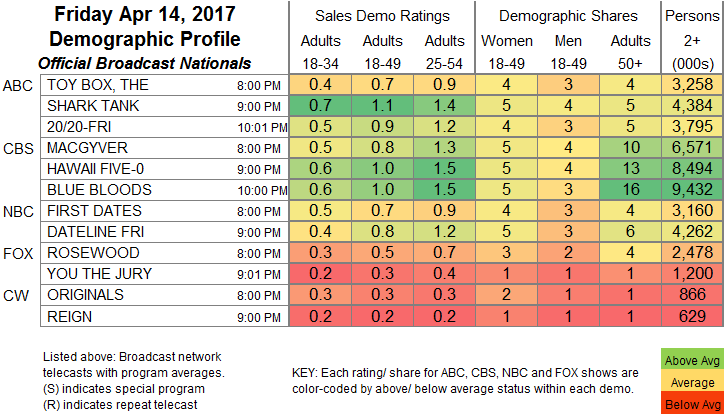 On Lifetime, BRING IT fell 0.07 to 0.32 without its RAP GAME lead-in, and lead-out THE POP GAME was down 0.09 to 0.17. VH1’s RUPAUL’S DRAG RACE held at 0.31. Spike’s BELLATOR was at 0.17. 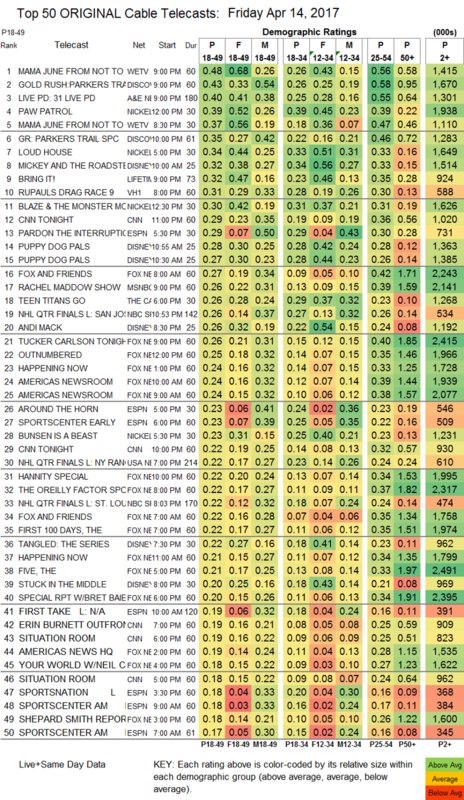 MTV’s RIDICULOUSNESS fell 0.09 to 0.14.